Today marks the centennial of the beginning of World War I. For those looking to comics for a quick and easy fix to explain how WWI started, there is indeed a comic for that. But for those looking to take advantage of the medium’s great ability to disseminate a deeper understanding of the conflict’s human impact, there are some exceptional titles available this year. These include anthologies like Above the Dreamless Dead and To End All Wars, as well as re-releases of classics like Charley’s War and It Was a War of the Trenches, to name a few. 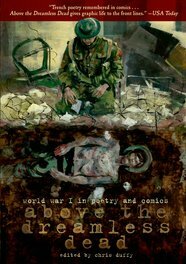 Today we’re taking a look at Above the Dreamless Dead (First Second, 2014), an anthology of comics written and drawn to WWI poetry and song. 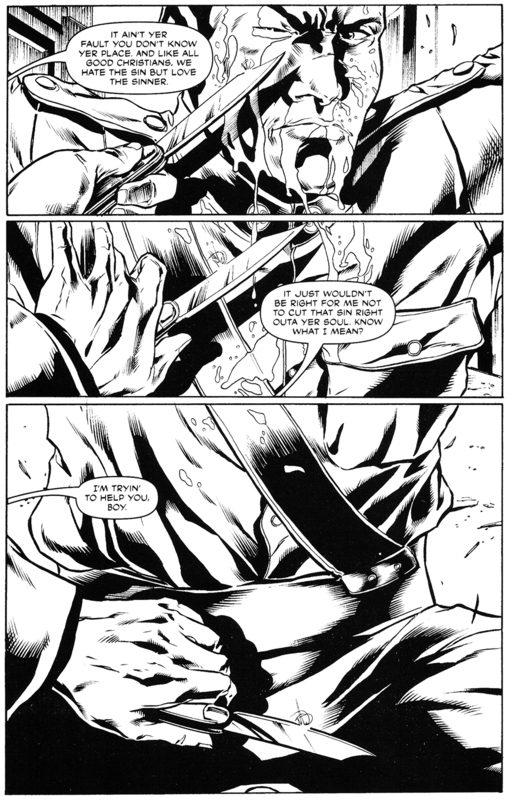 Contributions are made by Peter Kuper, Garth Ennis, Sarah Glidden, Hunt Emerson, Eddie Campbell, and many more. From the poem “Channel Firing,” by Thomas Hardy, adapted by Luke Pearson. The space between a human being, their pen, and a piece of paper is a place not for patriotism any more than any other compulsory thought. In a time when you could have been arrested for resisting a war that saw thousands die for every mile of ground gained, poetry gave precious creative room for soldiers and non-combatants alike to process the trauma and stress of a life at war. Counting the years both during and after the conflict (1914-1918), World War I poetry, has grown to become a huge body of literary work. It is within this section of 20th century literature that dozens of comics creators have put together a creative and aesthetically varied collection for Above the Dreamless Dead. 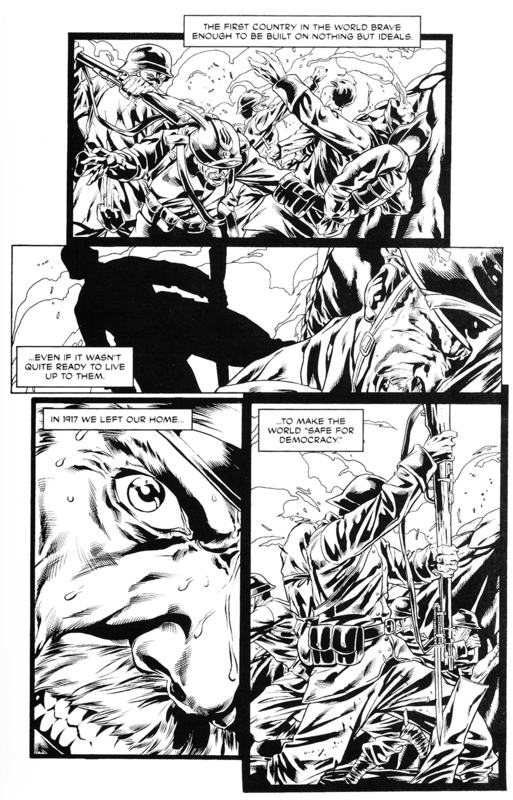 Soldier songs, like those illustrated by British cartoonist Hunt Emerson, satirize and make light of the harsh everyday of the soldier–whereas Eddie Campbell’s piece, illustrating an episode of Patrick MacGill’s “The Great Push”, plunges head-first into the darkest corners of the human soul. Still others transcend the ultimately subjective spectrum of human emotion, and attempt to seek solace in the naturalist truth that regardless of man’s follies, the earth will continue to be as it always has. Within the larger category of WWI poetry is the subcategory of trench poetry. Noteworthy space is given to the most well-known of these poets, namely Wilfred Owen, Isaac Rosenberg and Siegfried Sassoon. Bearing witness to some of the most hellish of situations imaginable, trench poetry takes the reader to another world of blood, mud, and pain, at one both impending and uncertain. The stress induced by the battlefield lent itself well to art, where soldiers could perhaps hold on to their sanity by airing their demons. In Isaac Rosenberg’s “The Immortals“, adapted here by Peter Kuper, we get a real taste of the fear and paranoia of the gunner who is tasked to shoot at an enemy that seems immune to death. The feeling of this unending hoard of soldiers leads Rosenberg to feel that he is fighting not a massive army, but the same undying soldiers over and over again. “The Immortals” by Isaac Rosenberg, adapted by Peter Kuper. The aesthetic diversity of the art presented in Above the Dreamless Dead is a reminder that WWI poetry is in fact a huge genre–and one that the book doesn’t even illustrated to its fullest, in my opinion. Above the Dreamless Dead focuses mostly on the poets proper of the era, and in doing so missed an opportunity to take a critical look at the growing argument for sexual and racial diversity of World War I poetry. Focusing on young white men in documenting the First World War is obviously the norm, whether you’re interested in comics, poetry, or history in general. But historian Dr. Santanu Das (King’s College, London) states that our understanding of the war’s poetry is changing as we come to recognize the diversity of the work written at the time and on the subject. “Today, no serious anthologist can ignore the poetry of non-combatants, civilians or women, such as the poetry of Thomas Hardy, or Rudyard Kipling, or Margeret Postgate Cole.” Note that neither Thomas Hardy nor Rudyard Kipling were enlisted, let alone combatants, yet they both appear in this anthology. Margaret Postgate Cole, a wonderful poet, was not, although it is arguable that she was more personally affected by the war as a socialist and activist (her brother was jailed for refusing military orders, after his application for CO status was rejected). Das continues, “We also must move beyond Europe, because there was war poetry being written in Turkey, India, and Eastern Europe. We cannot just limit ourselves to a narrow, Anglo-centric definition of First World War poetry. We should embed First World War literary memory in a more multiracial framework by investigating, recovering, and translating First World War poetry that’s being written often in non-European languages.” Suffice to say that there is no poetry here from a non-white or non-English-speaking perspective, in addition to there being no women poets. This criticism could surely be echoed for most graphic interpretations of World War I, but it is a point worth noting from the perspective of our mandate (see Harlem Hellfighters below, for the ONE exception to this rule that we could find!). As 2014 invites us to meditate on the “War to End All Wars” we encourage our readers to keep a lookout for examples, comics or otherwise, of marginalized perspectives/histories of the World War I. We hope that you pick up and enjoy your own copy of Above the Dreamless Dead, or any of the other WWI titles following! In 1919, the 369th infantry regiment marched home triumphantly from World War I. They had spent more time in combat than any other American unit, never losing a foot of ground to the enemy, or a man to capture, and winning countless decorations. Though they returned as heroes, this African American unit faced tremendous discrimination, including from their own government. Creators: Brick, Jonathan Clode, Michael Crouch, Steven Martin, Sean Michael Wilson, John Stuart Clark, Ian Douglas, Petri Hänninen, Bex Burgess, Stuart Richards, Lotte Grünseid, Chris Colley, Lex Wilson, Susan Wallace, Dan Hill, Faye Turner, Joe Gordon, Russell Wall and James Guy, Colm Regan, Andrew Luke, Sean Fahey, Pippa Hennessey, Steve Earles, Gary and Warren Pleece, and Selina Lock. An omnibus of 27 short graphic narratives based on actual events, characters, circumstances, incidents, myths or consequences of the Great War WWI. £2 for every copy of this publication sold will be donated to Medecin Sans Frontieres. Featuring the four theatres of war (land, sea, air and the home front), spanning four continents and drawn from both sides of the conflict, the stories range from 4 to 16 pages, each by a different author and/or illustrator from the world of independent comics. Arguably the most well-known WWI comic of all time. From renowned UK comics writer Pat Mills and legendary artist Joe Colquhoun comes a truly classic piece of British comics history, by turns thrilling, humorous and horrifying. From its initial publishing in the 1970s and 80s, it was widely considered to be anti-war. Title: Tardi’s WWI: It Was The War Of The Trenches/Goddamn This War! 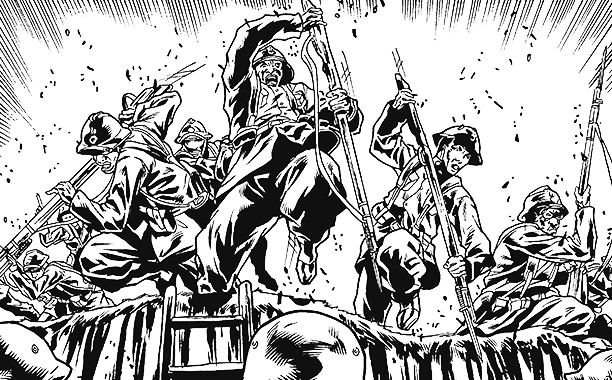 Jacques Tardi is responsible for two acknowledged graphic novel masterpieces about World War I: It Was the War of the Trenches and Goddamn This War! To honor the 100th anniversary in 2014 of WWI, Fantagraphics has now released a two-volume boxed set collecting these two perennial classics. The first book, It Was the War of the Trenches, focuses on the day to day of the grunts in the trenches, bringing that existence alive as no one has before or since with some of his most stunning artwork. His second WWI masterwork, Goddamn This War!, is told with a sustained sense of outrage, pitch-black gallows humor, and impeccably scrupulous historical exactitude, in masterful full color. When Lloyd and David Allenby arrive in the trenches of the Western Front, they have no idea of the misery and violence that awaits them. Can an aloof Major be the father figure and guiding force in their desperate battle for survival? Or will the estranged brothers be swallowed up before they can come to terms with each other, trapped in the clutches of the Great War? Trenches is about the beautiful stories that come out of dark times. For more info: Check out his website!